Book one of the Ray Series tells about a man whose life is in fragments. After he is fired from his job and fights with his girlfriend, Mexican vacations cannot cheer the nameless narrator of In Light of Ray. In desperation, he decides to follow the cryptic advice of Ray, a shadowy figure he has only met a few times. His understanding of Ray’s obscure suggestions takes him away from his friends and into unemployment, poverty and then homelessness. Drifting around a grittier Vancouver, he begins to think that the only way to fix his life is to die. This scheme to disappear so completely that his problems cannot follow him is profoundly disrupted when he meets Weed, a girl abandoned on Wreck Beach. His initial plan of suicide begins to look less feasible, and he tries to decide, on the basis of Ray’s ambiguous statements, whether he should die alone or invite her along. 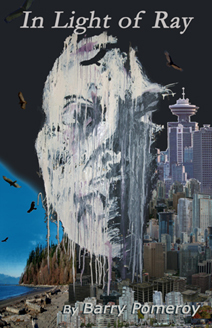 Ultimately affirming, this novel details a man’s drift from the Vancouver streets and the emptiness of dead-end jobs to a choice between embracing community and connection or disappearing into a waiting squalor.